1. Click on the INLOOX PM or INLOOX NOW tab and click on the arrow below Help. 2. Select Recommend InLoox PM or Recommend InLoox now from the drop-down menu. 3. A new window opens. Click Add on the dialog box. 4. Select the Outlook or InLoox contacts to which you want to send your software recommendation. 5. You can use the standard e-mail message. Or if you like, you can customize the message. 6. 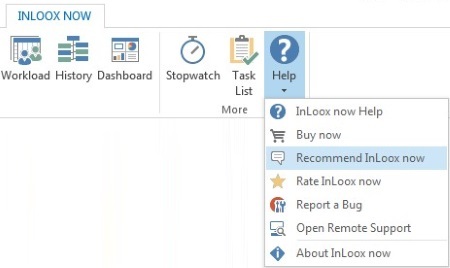 Click OK to send your InLoox 9 for Outlook recommendation via e-mail. Recommend InLoox 9 for Outlook • Copyright 1999-2019 © InLoox, Inc. All rights reserved.